DIY Electric Car Conversion – How Hard Could It Be? Home/EV Conversion/DIY Electric Car Conversion – How Hard Could It Be? Many people before starting their own DIY electric car conversion project, have an uneasy feeling because there are so many uncertainties. Some will even give up before they get started. If you are planning a homemade electric car conversion project, how do you get over your jitters? You can start by doing some readings on EV conversions. There are a lot of electric vehicle magazines and also web sites that you can read to feed your curiosity before you begin. You can also visit EV related forums on the web that a lot of electric car enthusiasts hang out and post some questions. The idea is to calm your nerves with some technical information. But beware, do not fall into the trap of “analysis paralysis” where you become paralyzed with fear because you did too much analysis on your EV conversion project. Overcome your fear by just doing it. The biggest hurdle that you have to overcome is removing the internal combustion engine of your donor car and connecting the electric motor to the transmission unit. This process involves a lot of technical precision. If you had an adapter plate custom made, changes are, you may face some unforeseen circumstances. You may get all the measurement and dimension right, but when you try to install it, the components may not fit exactly. Here’s a tip. Why not get a machinist to help you with the electric motor installation process? He will be able to studying your donor car engine compartment and would be better to anticipate any challenges that may occur. By doing so may cost you a few hundred dollars, but it will save you a lot of headache and also time and money wasted to redo the adapter plate. When the electric motor is in, the rest of the procedures are simple in comparison. The next big hurdle is to make the rack for the deep cycle batteries. 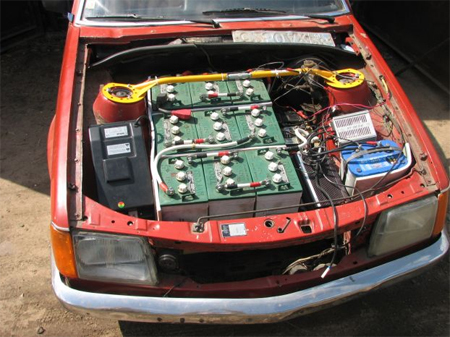 Generally, a homemade electric car would have 15 – 20 units of deep cycle batteries. The challenge here is to find the ideal space to store them without taking up too much of the interior space. When installing the batteries, what you must pay attention on is getting the right measurements. You can follow the rule of thumb for carpenter which is “measure twice and cut once”. In this case, measure the battery storage area twice before cutting the metal support frames. A DIY electric car conversion in actual fact is not very difficult. However, it does require a lot of persistence and dedication. If you’ve done some car maintenance on your own before, you shouldn’t have too much problem installing all the EV components onto your car. If you are a total newbie and you want to get some basic information on home build electric car, you can check out the Convert2EV e-book by Les Oke. Les Oke and his family live in Canada and they have been living a green lifestyle for more than 15 years. In order to have a low carbon footprint, Les and his wife drive electric cars that they built themselves. The Convert2EV e-book was written based on Les’ years of experience retrofitting conventional automobiles to run on pure electric power. For more information on the electric car conversion guide, click on the link below.